Walking along the streets of downtown Greensboro today, we are constantly reminded of those who came before us. Their names grace the city's street signs, businesses, plaques, buildings, and markers, demonstrating to us the extreme growth that has taken place in the 190-year-old history of this, one of North Carolina's most-loved cities. 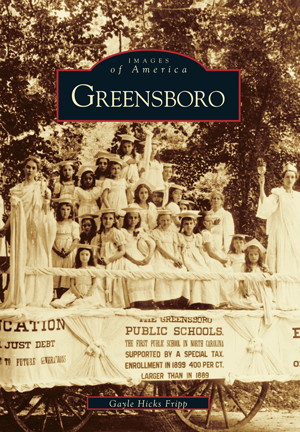 With over two hundred rare images, many never before published, Greensboro takes readers on a delightful journey back to the days when this small town was transformed from a quiet village to a thriving city referred to as both "the denim capital of America," because of its mill; and "the Hartford of the South," due to its insurance industry. Among these pages we meet prominent citizens like the Cones, who founded a textile empire; writer O. Henry; First Lady Dolley Madison; and the famous Greensboro Four, who challenged segregation with their sit-in at Woolworth's lunch counter in 1960. We also visit with everyday people who grew up here and worked in the mills or downtown shops and firms. North Carolina native Gayle Hicks Fripp is the assistant director of the Greensboro Historical Museum, and she is the author of a book and several essays published about the history of Greensboro. Her enthusiasm for preservation and her love for the area are clearly evident in this remarkable tribute to Greensboro's past.